Place egg whites and whole egg in bowl and whisk with a fork. Grate zucchini and dice onion. Plate oil in pan and heat. Add zucchini and oil and cook for 1-2 minutes or until onion is transparent. Add egg white and whole egg and tilt pan to spread unevenly. Season with pepper and add grated Parmesan. 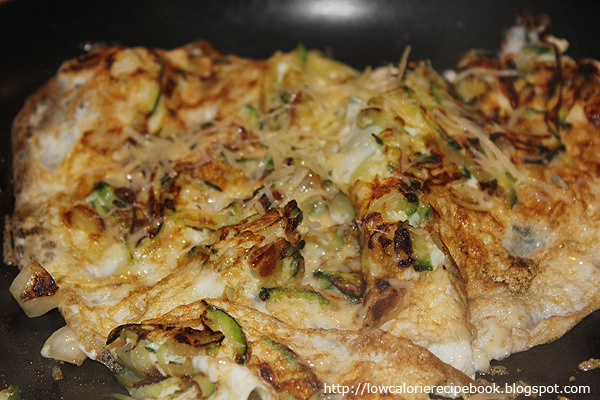 Lift the omelette as you cook ensuring uncooked egg creeps under the sides, cooking as quickly as possible. TIP: Make double quantity of the zucchini and onion and refrigerate for no fuss omelette the following day. Make eggs up on the day to ensure freshness. This recipe used the “good oil” Olive oil. Even though many of my recipes use no oil, I personally add a little of the good oils to my cooking for better health. Don’t skimp too much on oil as you need it. Gallstones are a nasty side effect from too low fat diets. We need these oils for many reasons.